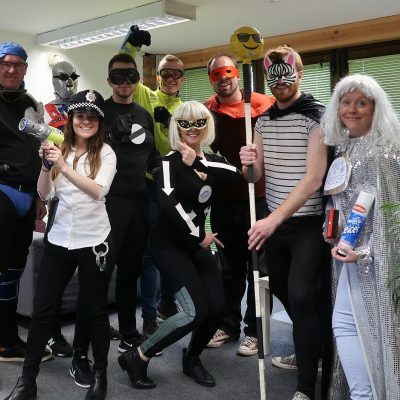 In support of Brake and Road Safety Week running from 19th-25th November, the JMDA Design team needed no excuse to don fancy dress and get creative with their own road safety superhero costumes to raise awareness of road safety. JMDA made Brake their chosen charity for 2018 at the start of the year. Running from 19th-25th November, Road safety Week is the UK’s biggest road safety event, coordinated annually by Brake. Road Safety Superhero Day brought the week-long campaign to an end and saw the JMDA team spread the message of safe driving with the use of home-made costumes, masks, props and wigs. The JMDA team agreed they wanted to get creative and design their very own superhero costumes inspired by everyday dangers on UK roads. JMDA are advocators of road safety and are passionate about the protection of children when travelling in vehicles. As industry leading designers of Child Restraint Systems (CRS), JMDA work hard to design practical and stylish products that meet performance and safety requirements and challenge the boundaries of innovative design. JMDA pledged to support Brake at the beginning of 2018 and have enjoyed participating in numerous dress up, baking and fundraising challenges in a bid to raise funds for the charity. Brake is reliant on volunteer support, donations and fundraising to enable them to work to end the carnage on roads, make communities safer, and care for people devastated by road death and injury. The JMDA team look forward to announcing their fundraising total at the end of the year and making their final donation to Brake in December. View pictures of JMDA’s road safety superhero dress up event by visiting the galleries page of the JMDA website. For more information about JMDA’s design of CRS or to find out more about their support of Brake over the last 12 months, please call +44 (0) 1386 426100, or email [email protected].